Dental bridge acts as a bridge where there is a gap in the teeth. 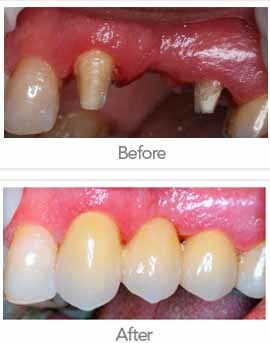 Crowns are fixed on the teeth either side of the gap, these are then joined by a false tooth which bridges the gap. The dental bridge is permanent and will be matched in colour to your other teeth so the appearance of the new tooth is natural. The bridge stops the adjacent teeth from moving. 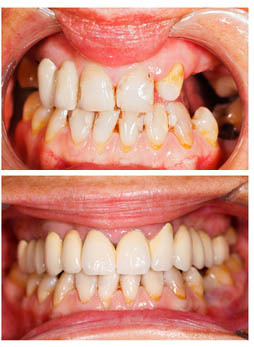 Missing or crooked teeth can affect your smile, confidence and facial appearance. Missing teeth increase the chance of food accumulating in the gap, which may cause gum disease and tooth decay. A missing tooth may have an impact on bone loss unless replaced. In addition, it can also be uncomfortable when eating. Adjacent teeth start to lean into the space of the missing tooth and alter the way upper and lower teeth bite. The dentist will give you a local anaesthetic prior to the procedure. The dentist will then start by preparing your teeth on either side of the gap as trimming is needed to accommodate the crown. The dentist will then take an impression of your teeth using special dental silicone to make the mould. This mould will be sent to a dental laboratory to prepare the dental bridge and crowns. You will receive a temporary dental bridge until the permanent dental bridge is ready. The dentist will ensure that the natural colour of your teeth match the dental bridge. When the permanent dental bridge is ready, the temporary bridge will be removed and the bridge fitted.